REMOVING THE FOIL BACKING FROM RHINESTONES AND GLASS JEWELS..EASILY! Working with chain can be rewarding or it can be frustrating. Curb chains are easier to work with than cable, rollo, or belcher chain because curb chains tend to lie flat. Trying to get the right look out of the other chains can really ruin your hair because it looks really bad with those hanks you ripped out! In an effort to prevent frustrating hair loss, SandWitch and Warlock presents these lessons on working with chain. OK, let us first learn how to measure chain. 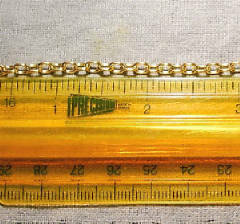 In the following picture, you will note how the chain has been stretched against a ruler to get an accurate measurement of its length. When working with cable, belcher, or rollo chain the exact length is not nearly as important as the link count. If these chains are to be attached at both ends to other parts of your creation, it is necessary that the number of links be an odd number. If the number of links is an even number then the chain will not lie properly. 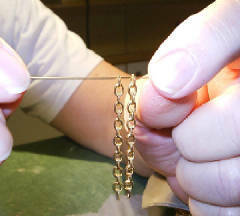 Now we can look at a way of easily duplicating the exact length of multiple pieces of chain. This method is wonderful for creating chain tassels or festoons for necklaces. 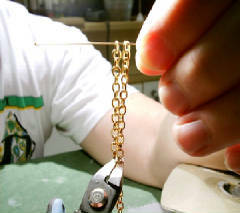 Notice how a precut and an uncut piece of chain are being suspended from a wire. If we let gravity do its work, we will be able make a cut that exactly duplicates the link count of the first chain. So much easier than going blind while trying to count links! Using this same procedure, we can create progressively longer or shorter links. This will make it far easier for you to create chain segments that will lie properly. It is important to remember that each segment must always have an odd nmber of links.